Mark and I met at a Meetup.com event in Seoul during the last Chinese New Year. Events on Meetup.com are great venues to meet new people who share common interests. 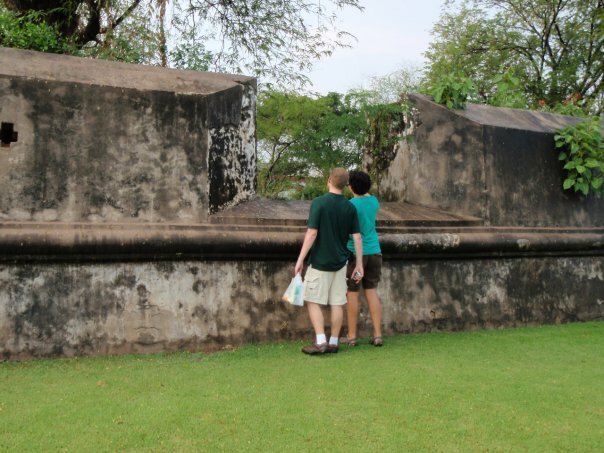 When we moved to Thailand, Mark and I joined some Meetup groups to explore Thailand and make some new friends. But the few traveling groups are no longer planning events. So Mark and I started our own group. This trip was our first event as a group, though only one person showed up. John was a great member to have on a trip. He speaks Thai and knows his way around Thailand. Mark and I planned the trip, but John knew more about what to do. I hope he joins us on many more trips. I don’t have enough gas for today. After wandering around the bat temple, John, Mark, and I wanted to take a boat back to the town of Chachoengsao. There was a dock by the temple. At the dock there was a parked boat, and in the boat was a boat driver. John, using his Thai skills asked him how much it would cost for him to take all three of us back into town. He said the price was 1,500THB. We thought that this was a bit much since it would only cost us 18THB per person to take a songtow back; not to mention that it cost us 61THB per person to get here from Bangkok. The long-boat guy wined and said something about gas being expensive and that he didn’t have enough gas for the day. This didn’t make any sense. He even showed us his gas as if it would add to his credibility. I gotta be on a boat. 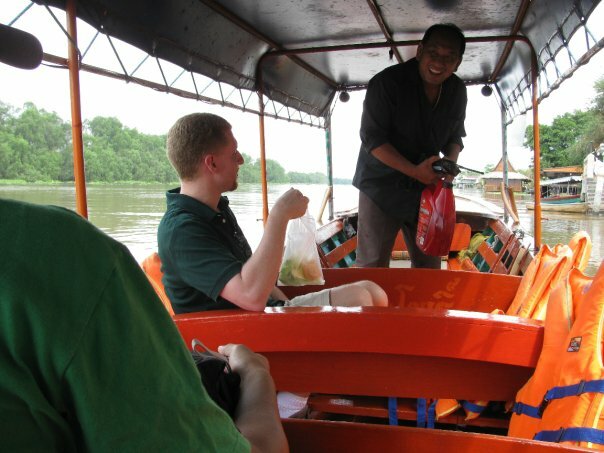 We had decided, before we even got to the temple, that we were going to boat down the Bang Pa Kong River. John managed to talk him into just boating us around in a circle for about half an hour and only charging us 500THB total. He actually ended up taking us around for about an hour and a half. He even stopped off at a little island market. We walk through a coconut farm and Mark became obsessed with stealing a coconut. But stealing one proved to be a lot harder than it looked. Mark had been watching Survivor: Cook Islands. One contestant, Ozzy, made getting coconuts look way too easy. Mark tried to climb a coconut tree, but he could not get off the ground. Then he tried to throw things at the coconuts to knock them off. But he could not throw high enough. He even tried yelling at the coconuts. They would not listen to him. Eventually Mark had to give up and just buy one. They sold grilled coconuts at the market. Personally I don’t like the taste of coconut water. 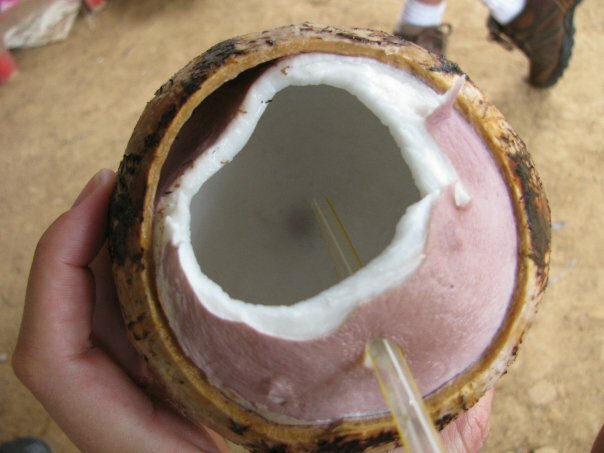 To me, it has the flavor of coconut and unsalted sweat. But the water from these grilled coconuts were great; plus it was a hot day, the coconut water was cold, and it only cost 5THB. 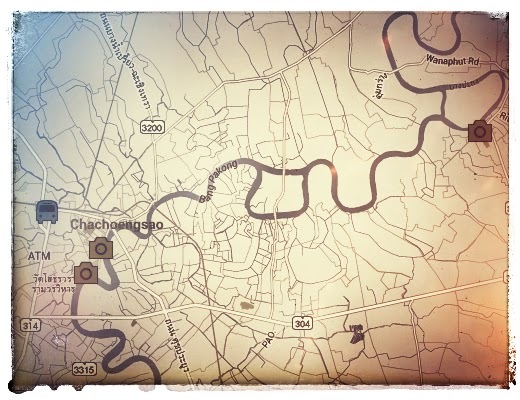 Later we walked about in the town of Chachoengsao. 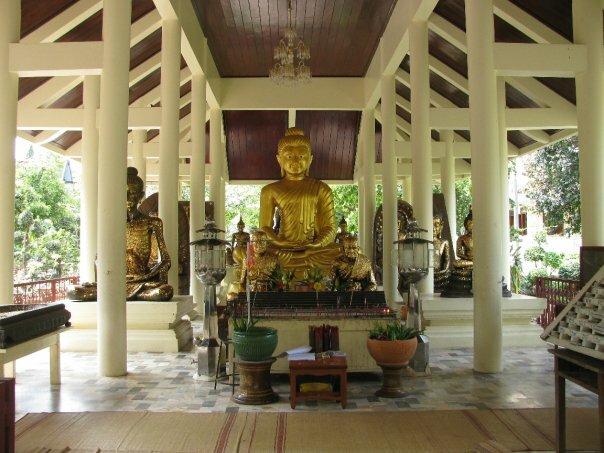 We happened upon the Wat Sothorn Wararam Worawihan. This was the most beautiful temple I have ever seen. It was so sparkly. I had to take a video of it since the sparkles didn’t show up in any of my photos. There were many people on the temple grounds. 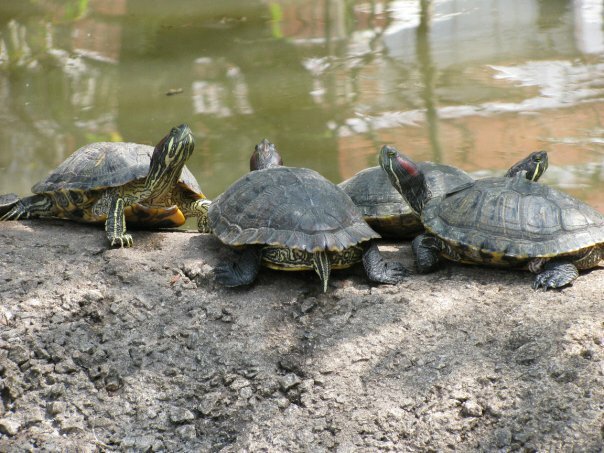 Most of them were stretching and exercising. It seemed like a great place for people to run and workout without a chance of being hit by a car. Unfortunately there were too many scooters zooming around to make the area completely safe. Go to Mo Chit Bus Terminal, first floor, inside at counter #57. The tickets will cost 61THB. It will be for a van. The driver of the van will drive as if he thinks he is in an episode of The Dukes of Hazzard. It scared the heck out of me, but Mark and John seemed not to mind. There are hardly any buses that go around the town. The main way to move around here is by tuk-tuk or songtow. Take a red songtow to Bang Khla. just flag down any red songtow heading toward Bang Khla. The red ones seems to run between Bang Khla and the Chachoengsao Bus Terminal. The songtow will cost about 18THB per person. There is not much to do in this town, but there is a floating market. 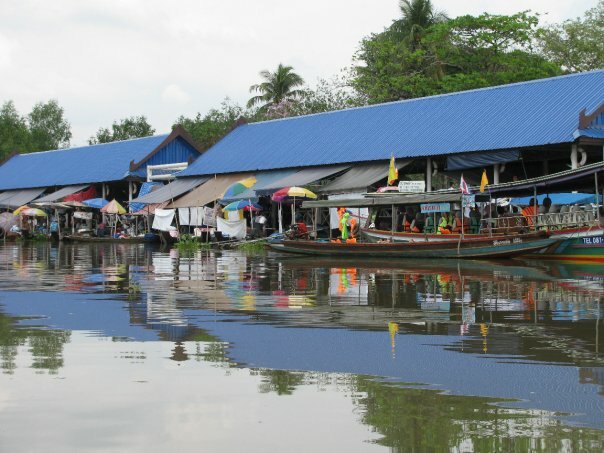 Of course, this is Thailand; there are floating markets everywhere! You can just walk down the street a couple of minutes to the temple. Ask the sontow driver which direction to go. To go back to Chachoengsao get on a songtow near where you got off. The ride should cost 18THB per person. then take a left onto highway 3121. 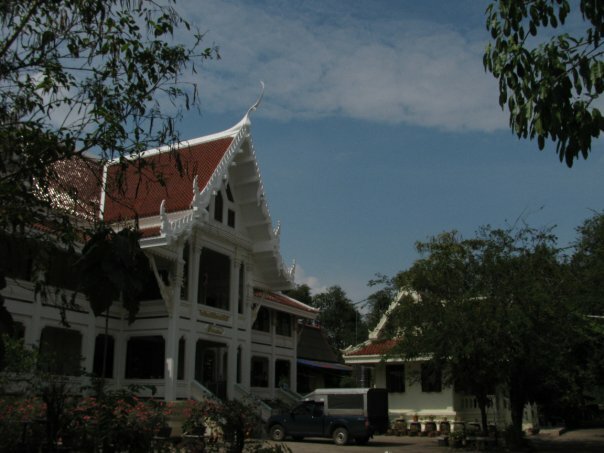 Drive through the town of Bang Khla for about 6km, past the shrine and the monument of King Taksin the Great. The temple is about 500m on the left. From here you can get a boat down the Bang Pakong (แม่น้ำบางปะกง). Just make sure you have good negotiation skills before you engage a boatman. When on the songtow heading back to Chachoengsao, get off right after the bridge. Walk along with the river on your left. The Old Fortress will be on your right. On the Thanon Maruphong, south of the hospital. There is no way to get in. This fortress is viewed from the street and this can be done 24 hours a day. The Old Fortress is not that interesting and is only worth seeing it if you happen to pass by it. Don’t go out of your way to see it. It’s really just a wall. Most of the fort is gone. Here is a map. The Old Fortress is near the Maru Phong Garden on this map. It’s number 4 on this map. Or you can use the map below. Or you can just look up. You can see the temple from almost any spot in town. 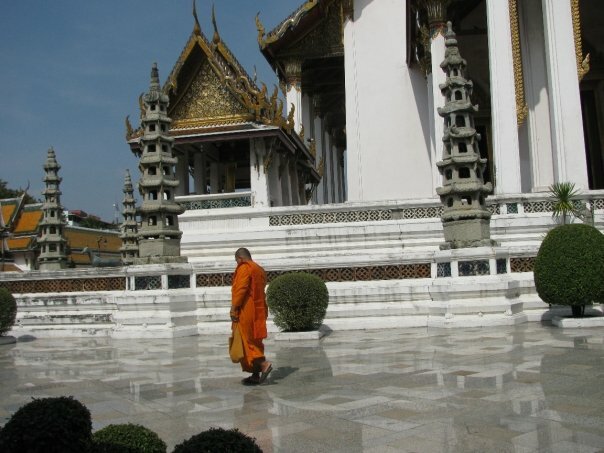 It might cost something to go in to see Phra Phuttha Sothon, the famous Buddha statue inside the main temple. It seems that the people living in this area use the grounds of the temple as an exercise area. There are many people jogging, walking, and biking around. Watch out for the bikers. They don’t watch out for walkers. This is one of the prettiest temples I’ve ever seen. It has a bit of a mega church feel to it. It is nowhere near the size of a mega church, but it is pretty big compared to most Buddhist temples. The Phra Phuttha Sothon statue was said to have been found floating in the nearby river before it was put in the temple. 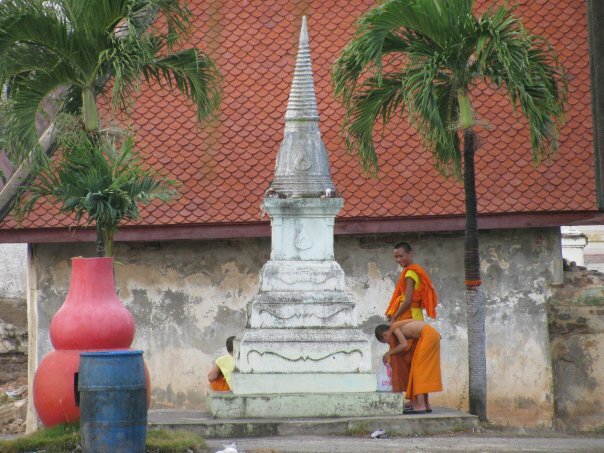 People believe that praying to the Buddha here will help women have sons.